Are your kids heading back to school soon? I know you are probably stressed that the new school routine will get them out of their summer routine of eating clean. You’re right to worry about it!, kids school lunches are typically not that healthy. Whether you are talking about school lunches or your typical “lunch foods” that you can find at the supermarket, there isn’t really a lot of pre-made lunch items that fall within clean eating guidelines But put your mind at ease. Just because they are going to be in school all day doesn’t mean that you can’t make sure that they continue to eat healthy! First and foremost, if you want your children to eat clean, you will need to send them lunches from home. As sad as it may be, school lunches for the most part just don’t fit into a clean eating lifestyle. So make sure that you have plenty of ingredients at home to keep the clean eating lunches coming all through the year. And remember, meal planning is key to maintaining a clean eating diet, especially when you have to make lunch every day. Meal planning isn’t just for dinner. You should also be using meal planning for breakfasts and lunches too to keep yourself and your family on track. As an added benefit, meal planning will help you save a significant amount of money on your grocery budget. Anyway…check out my FREE Meal Planner here and get started planning out all of your meals for each week. 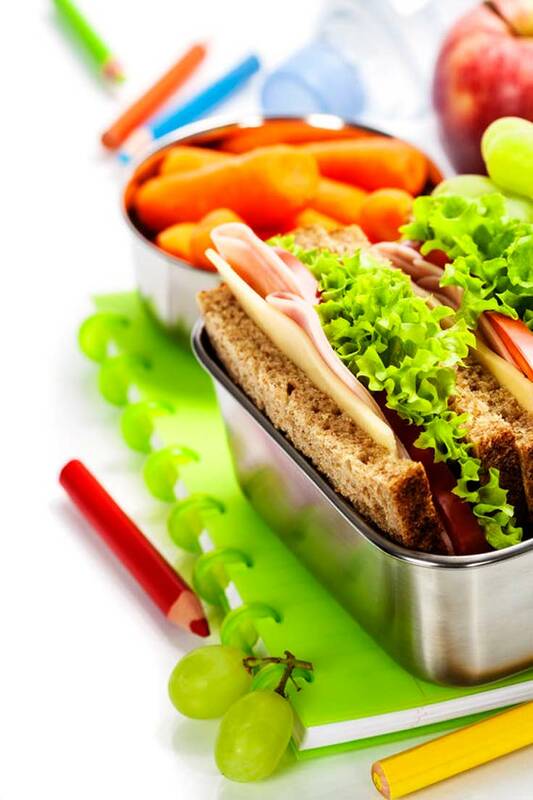 The next thing to focus on when talking about back to school lunch tips is to make sure that the foods you send with your kids are convenient (and tasty, of course). For the main dish, I suggest something like these Apple and Smoked Gouda Kabobs or these delicious Tuna Sandwiches. You can also create delicious snacks to send with the kids like these No Bake Granola Bars or these Clean Eating Lunchbox Muffins. Packaging makes a big difference too! Bento Box lunches are a great route to take because they are well organized and the kids don’t have to fight with baggies and garbage that they leave behind. Just one simple box and you have all of the storage space you need. Plus, with the compartments that Bento Boxes offer, the kids will have a good selection of foods. Especially for little kids, selection is often key. Check out some Bento Box lunch ideas here. Don’t forget about after school snacking too! Those kids will be hungry when they get home. Be sure that you have lots of good clean eating snack ideas to work with throughout the year. I have a great list of kid friendly foods that you can have ready for when they walk through the door ravenous and ready to snack. So as we kick off the Back To School season, I hope this list will help get you started with packing healthy lunches! Stay tuned for more clean and healthy lunch ideas coming your way this month!